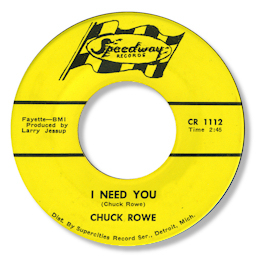 As far as I am aware this stripped down, almost minimalist, recording by Chuck Rowe was his only disc. The focus on I Need You is all on his voice and he certainly delivers the goods. Aaron “Little Sonny” Willis owned the Speedway label in Detroit but this obscurity doesn’t seem to figures in any of the discographies. Strange. "this record was recorded in 1969 in Jackson, Mississippi but came out on a Detroit label. Later blue-eyed soul singer Rowe moved to L A where he worked with Ike Turner. Later he went to Florida." Greg also sent a link to Chuck's own Youtube channel which you can find here. As ever I'm grateful to Greg for his excellent sleuthing.